Sweetened jelly is one of those universally recognisable desserts that seems to have never fallen out of fashion. Incredibly popular as a children’s treat, the humble gelatinised treat was born out of wartime necessity to become a staple that has interpretations in virtually every culture. It's no wonder why when you consider that gelatine is incredibly robust: it can gel several times its own volume in water, accommodate the additional of most other ingredients, it’s colourless and mostly tasteless. But most importantly, no matter how you know it or what kinds of ingredients you make with it, there is something inherently fascinating about setting liquid into a wobbly yet solid form. What makes this recipe such a standout is how well it integrates the features of our Orange Brûlée tisane. The deep, natural orange pigment and the coppery red of the rooibos shine through the clear set gelatine. 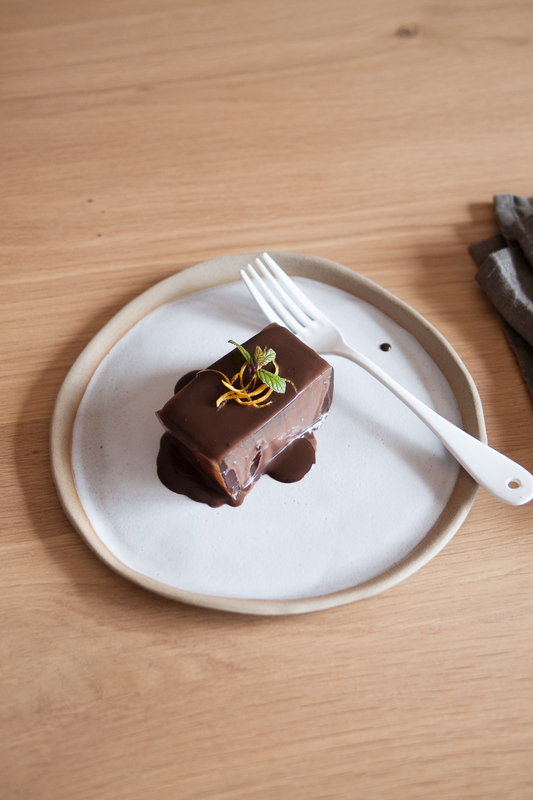 Hold the jelly up to the light and witness the clarity of that brilliant orange... and then devour it by the spoonful with a generous helping of dark chocolate ganache! There is just the right amount of sweetness, perfectly counterbalanced by earthy vanilla and the spiciness of cardamom and ginger. This gelatine-set Orange Brûlée dessert is caffeine-free and totally natural, with all of the flavours and colours derived from whole ingredients. For the adventurous, you could even add segments of fresh orange into the jelly mixture and allow it to set. And lastly, if you're just not that into sugar, you can certainly omit it altogether. We're certain that a sugar-replacement such as powered stevia or saccharin would work just as well, but be aware that it will add a cloudiness to the final product. Bon appétit! Soak gelatine sheets in a bowl of cold water for 5-7 minutes. Squeeze the sheets to remove any excess water and set aside. Meanwhile, prepare 500mL of boiling water, add in 2.5 teaspoons of Orange Brûlée and steep for 5 minutes. Strain into a bowl. Add the sugar and gelatine sheets into the Orange Brûlée solution and whisk vigorously to dissolve the crystals and melt the gelatine. 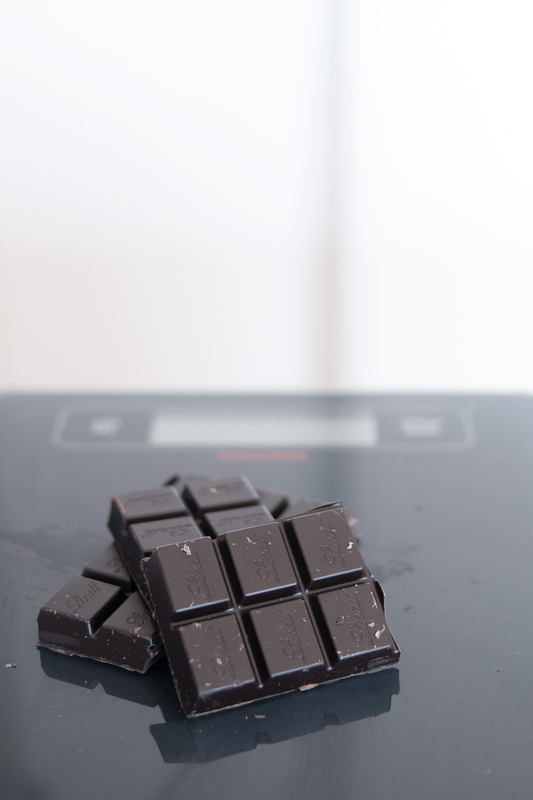 Pour into a mould of your choice; in our case, we used a 20cm rectangle baking dish. Chill for at least six hours, or until firm and thoroughly set. Bring a small pot of water to the boil. Meanwhile, carefully peel the skin of an orange, being careful to avoid the pith as much as possible. Add the peel to the pot for 30 seconds (blanch), then discard the water. Repeat the blanching process 3 times to remove the bitterness of the peel. Boil water and rain in the sugar. Whisk until the crystals are fully dissolved. Reduce until a quarter of its original volume. Stir in the orange peel and coat thoroughly. Remove the peel from the pan and cool on a piece of parchment paper. Prepare the ganache by gently warming the cream to a simmer. Add in broken up chocolate. Stir until the consistency is thick and glossy. Allow to cool for 3 minutes. Loosen the jelly from the mould by submerging the dish in warm water. Portion and cut (if desired) or serve whole and place onto a serving dish. 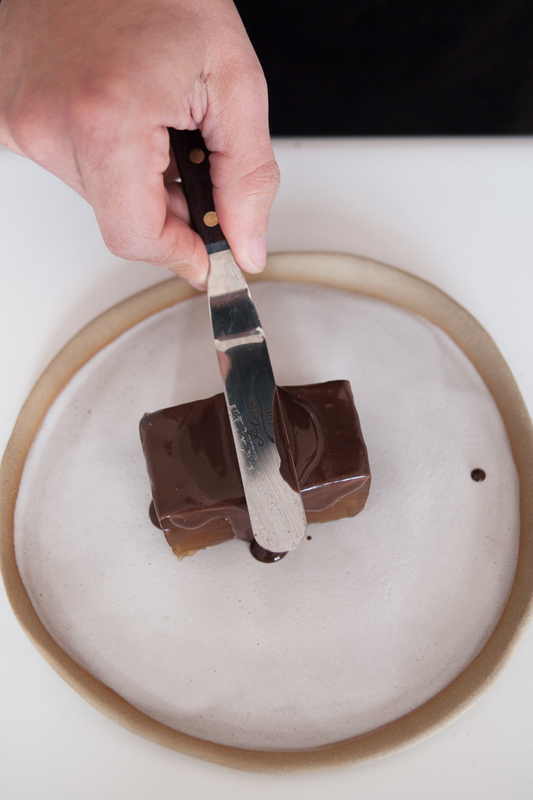 Spoon the ganache over the jelly and smooth with a flat palette knife or butter knife. Allow to set for 2 minutes. Top with candied peel and garnish with a sprig of mint. Serve or immediately return to the refrigerator. Sign up to receive news, offers, and 10% off your first order. © Endeavour Tea. All rights reserved.